I’m super excited to show you the results of my very first designer collaboration! 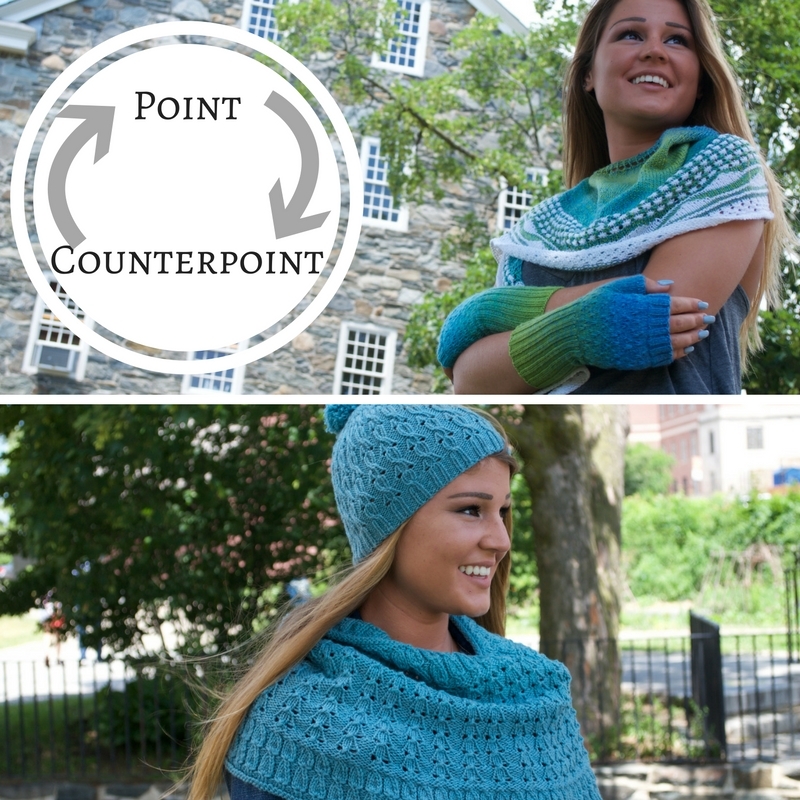 Introducing “Point/CounterPoint volume 1”. Mary of Kino Knits contacted me with what I laughingly call a ‘designer dare’.We each designed an accessory without consultation. Then we showed each other a picture of what we had made, took the same yarn as the other designer, and created something to coordinate. The challenge was to create something that echoed and magnified the other item’s aesthetic, without actually having information about what stitches the other designer used. (In fact, Mary made up the eyelet cable stitch for her hat!) So these accessory sets coordinate but don’t match. They absolutely look like they belong together – Mary confided she had a hard time popping my stuff back in the mail after the photo shoot since she felt like she was breaking up something meant to be together. We chose Cascade yarns since she was in Africa and I am in an area without a lot of access to go out and get my hands on yarn and see how it behaved. Cascade has a large range of very useful yarns at great prices. We settled on 220 Sport Superwash and Cascade Heritage. Simple yarns in fantastic blues that feel soft and drape wonderfully. 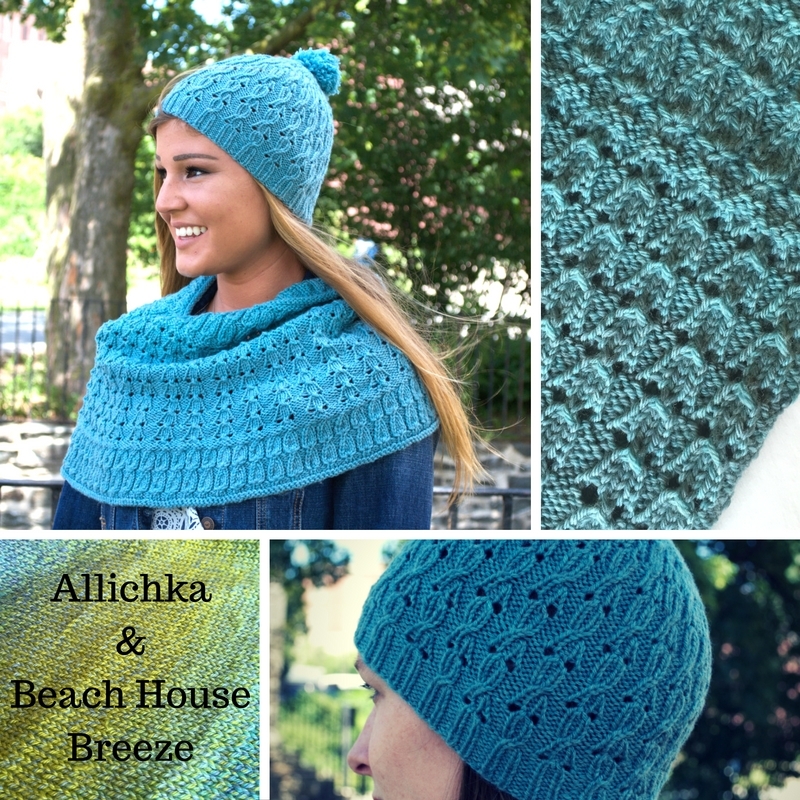 Mary designed the Allichka Hat while I worked away on the Snowfall on the Mountains shawl. It was my very first shawl design and I played with two stitch patterns that really tied into my tendency to look to landscapes for inspiration. The sweep of a crescent shape seemed the best fit, and allowed me lots of space for the subtle colour shifts of the main colour. Then came the big reveal. I can’t speak for Mary, but I sat, staring at the photos in my email inbox wondering what on earth I was going to do when I saw her hat! I wouldn’t let myself freak out – I went for a run. Later on, I sat down with my skeins of the yarn and every stitch dictionary I own and started flipping through the pages. Sticky notes were my friend. 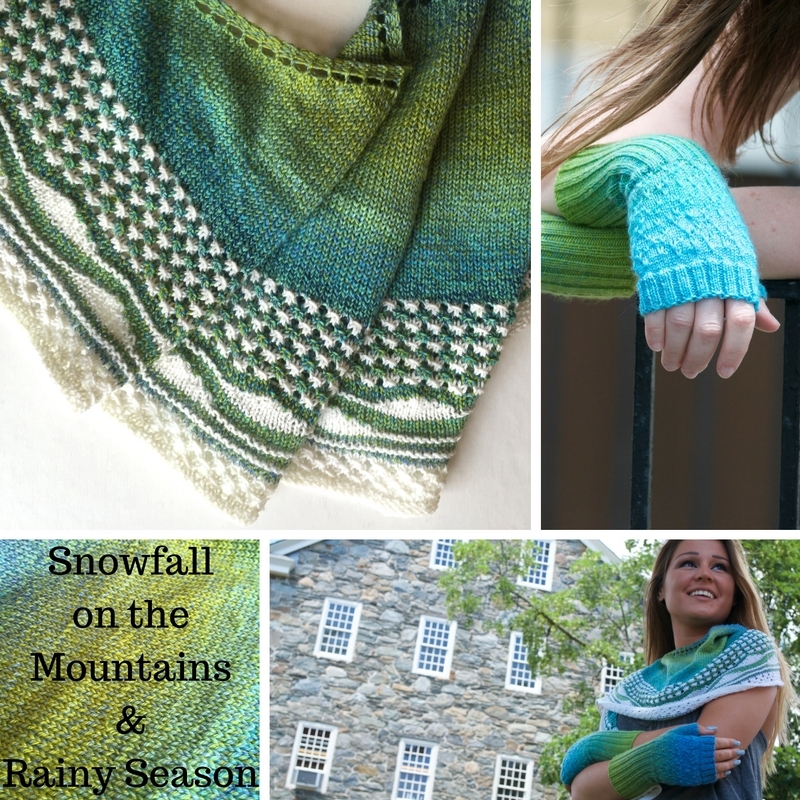 I wanted to echo the double eyelet and the feeling of sinuous vertical climbing on a cowl. The lacy stitches on the hat made me think of the early days of autumn – when you want a little more warmth but don’t need heavy-duty layers. I decided that I wanted a cowl that was much like one I already owned – it had a tapering shape that narrowed at the top. I loved how easy it was to wear – it just fell around my neck with effortless style and I could pull it over my shoulders if I was chilly. Quite a few podcasters have agreed to review the collection and host giveaways, so be on the lookout for those! Mary and I also had a great conversation all about the project that will be on the next episode of her podcast Kino Knits.